FROSTBURG, Md., Nov. 12, 2015 — The Potomac Highlands Distance Club will return to action in the tri-state area in 2016 with a limited schedule — and a brand new way for you to become a member. Borrowing traditions from running clubs PHDC Executive Director Kevin Spradlin crossed paths with while traveling the past two years, lifetime membership in the PHDC will now be secured by completing a hat run. The hat run will be a supported, organized training run. The distance (between 10 and 15ish miles) and site is not yet finalized. Read more on the details of the hat run concept below. The PHDC will also return to area finish lines as official timer and event management consultant in an effort to raise funds for the club, founded in 2008 as the Mountain Maryland Marathon Club. In 2016, races expected to return include at least one in Hancock, Md., and the club’s flagship event, the Fire on the Mountain ultra trail race in Green Ridge State Forest. The distance of FOTM could change because the course could become a single-loop race instead of a point-to-point adventure. The date of that event also will move, from the last Sunday in October to the first Sunday in November. A snow/ice date will be the second Sunday in November. Be sure to check the PHDC’s official calendar on www.PhDispatch.com for details and updates. 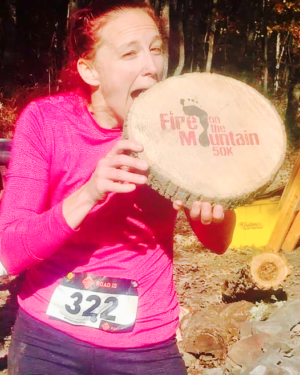 As in years past, there will be a special entry period for the Fire on the Mountain ultra trail run in Green Ridge State Forest, set for Nov. 6, 2016. Early entry will be $45 and will include an event T-shirt, seven stocked aid stations and finisher medals for all finishers under the pre-determined cutoff time. The special entry period will be announced in December and be good through Dec. 31. The entry fee will increase to $60 beginning Jan. 1, 2016. In a much more official capacity than before, the PHDC will serve in a supporting role to a variety of events in the tri-state area. “Some of these events have a team concept, and it should prove to be a lot of fun,” Spradlin said. Runners don’t have to be PHDC members to be a part of these team events. The club staged a XC Getaway in the Maryland Mountains a few years ago. Based at New Germany State Park, runners of all ages were introduced (or became reacquainted) with trail systems in Maryland’s two westernmost counties. This will likely take place in July or early August. Stay tuned to www.PhDispatch.com for details. How it works: Roughly twice a year, the PHDC will announce a hat run on the club website (www.phdispatch.com) and here on the PHDC Facebook page, and at the end of the run – which will have a defined start line and start time – runners and walkers will be encouraged to sign up to participate (with the four-legged canine friends on leashes welcome and eligible for membership). Each hat run will be limited to a certain number of participants. The real fun begins with the second hat run and beyond. That’s when aspiring PHDC members get to run with returning PHDC members (those who already have completed a hat run) on the hat run course. There will be no limit on the number of returning PHDC members who want to complete a 2nd, 3rd (etc.) hat run. The idea is for these hat runs to become self-sustained and those returning PHDC members to cough up a few dollars in cash to cover the cost of the hat given to each first-time finisher, which will serve as a symbol of their lifetime PHDC membership. With any luck, the donations – along with proceeds from PHDC-managed races – will also cover the cost of PHDC stickers for each finisher as well as food and drink that will be at the finish line of each hat run. The Mountain Maryland Marathon Club had a soft launch in April 2008 with the Spring is Here! 10K in Cumberland. A year later, the club staged the Mountain Maryland Marathon Festival, which included a marathon, half marathon, 5K and a kids’ marathon in partnership with the United Way of the Potomac Highlands. The Mountain Maryland Marathon Festival was stopped after 2010 due to declining sponsorship, and the club was renamed the Potomac Highlands Distance Club later that year. The club has been a nonprofit member of the Road Runners Club of America since Spring 2009. That, too, could change in 2016 and the PHDC could operate as a private organization. Since 2008, the PHDC and its runners have helped to raise more than $80,000 for a wide variety of special and worthwhile causes, including memorial scholarships, the United Way of the Potomac Highlands and much more.